In any all-encompassing debate, the overall balance/equilibrium of hunting’s impact is the only logical way to reach an overall conclusion, but perhaps it would be better spilt out and debate specific elements of hunting activity in the future. Note: It should be noted, that the “Online Voting” pre-debate poll (far right in the figure above) was subject to a flaw upon internet browser refresh (not openly admitted by anyone it would seem), that permitted an individual multiple opportunities to register a vote. So from an academic point of view, the “Online Voting” pre-debate poll is relatively meaningless. It could also be argued (less convincingly because the debate audience polls were one person, one vote) that the debate audience was hijacked by “antis,” but unless there was collusion at the start with a concerted effort to disguise such ‘feelings’ by pretending to be undecided (44%), such a conspiracy theory would seem improbable. The IUCN Briefing Paper did highlight that there are indeed hunting examples of “weak governance, corruption, lack of transparency, excessive quotas, illegal hunting, poor monitoring and other problems in a number of countries” – so we are on the same page there, though this IUCN admission is glossed over for much of the remainder of their paper. Use “sound analysis…..” – Well that’s exactly what the EU’s Scientific Review Group (SRG) is supposed to do! So, hold on a minute……..if the EU decides that a lion trophy (for example) to be imported into the EU does not meet the EU’s WTR (based on SRG advice etc. ), ie. the trophy is from a poorly managed, corrupt , excessively ‘harvested’ and poorly monitored source, where financial transparency is non-existent (ie. clearly there is no conservation value from the given hunting the given trophy is sourced from), the IUCN thinks the emphasis should be on the EU to first seek to remedy all of that before taking any action whatsoever to restrict the trophy import? Where is the hunting industry’s mandate to self-regulate in the name of its claimed overriding objective for ‘conservation’ gone (or when the hunting industry has been shown to be lacking scruples for such a long-time, why should it be allowed so much leniency)? Where has the country in question’s mandate to ensure sustainability of its wildlife gone, not to mention protection of indigenous people and local communities without resorting to wildlife abuse? When did it become the EU’s sole obligation and responsibility to put all that is wrong to right, whilst the hunting industry and the trophy source’s country should be allowed (in the IUCN’s wisdom), to continue to practice and profit from a clearly non ‘conservation’ hunting activity? Since when has the EU not been allowed to restrict imports of its own volition based on its own stated rules, without a third party’s stated caveat that first the EU must seek to somehow make the import acceptable within the source country? The premise has always been, if you want to trade, the obligation is to meet the required criteria oneself and until compliance is met, not to be shown enduring leniency. 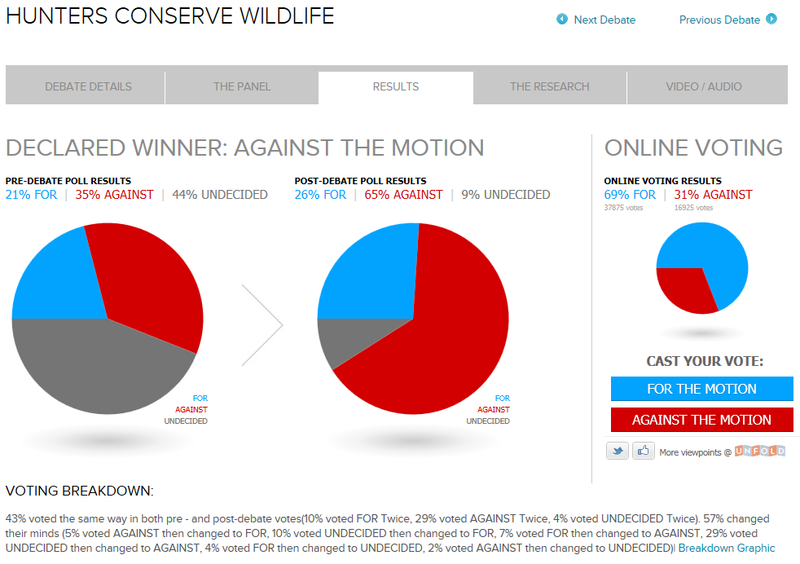 I understand the IUCN are saying; even hunting that does garner conservation (ie. hunting is helping to deplete the given species’ population), must be allowed to continue because if you take that away, the local people will be deprived of income and will possibly kill all the wildlife! However, the IUCN should be calling upon reform of the hunting industry to sort out the self-created mess, ensure sustainability and wildlife population protection, not calling upon the EU to sort out the hunting industry’s mistakes and over-sight. To be clear, all the ‘Written Declaration‘ sought to do, was to call on the European Council and Commission to ensure adherence to the EU’s own Wildlife Trade Regulations (WTR) when considering hunting trophy imports into the EU – the WTR stipulate sustainability and proven target species conservation as a core requirement. So seeking EU adherence to WTR should be welcomed by anyone interested in proven conservation, including self-professed Trophy Hunting ‘conservationists’ (and the IUCN). So, in conclusion, I share the view that the IUCN Briefing Paper is a highly biased misrepresentation, and the emphasis on reform (where needed) is misplaced and naïve. So, let’s return to Catherine………..there was a lot of talk and numbers about habitat protection, hunting income and the ‘belief’ she holds that this is direct evidence of ‘conservation.’ But this ‘belief’ is not direct evidence/proof of species’ conservation per se in every case; land rights and income does not equate to wildlife conservation by default. Also, Catherine stated Cecil was “just one lion” and he was part of a conservation project “funded by hunters.” Well, wrong on both counts; lion dynamics are complex, so the consequences of hunters killing “just one lion” can easily ripple out into a pride with devastating consequences (infanticide by a new incoming dominant male for example(2)(3)). Cecil was a collared lion, being studied (which does not necessarily mean there is any positive ‘conservation’ impact by default, a study has to prove itself of worth) by the Oxford University Zoology Department, Wildlife Conservation Research Unit (Wild CRU) – Wild CRU draws its funding from numerous sources, including public; indeed I have donated in the past to Wild CRU and I am certainly not a hunter. So it is disingenuous to say only “hunters” fund Wild CRU’s studies and that any such studies are ‘conservation‘ – only when such studies yield conservation results can they be deemed ‘conservation.’ But of course, first of all hunters (etc.) need to stop killing the study participants to enable the possibility for any positive ‘conservation’ results to emerge! Anthony displayed a predominantly North American focus, concentrating on hunting concessions and habitat/land ‘control’ and maintenance – the acreage (“millions”) and income (“billions”) numbers were duly given out, but this does not equal species management by default. “A sustainable, repeatable model……” advocated by Anthony, is not one based on killing an animal (a one off event), but upon maintaining an animal for species’ reproduction and repeat appearances/income. Anthony also played on the historical prevalence of hunting and its role “in the circle of life.” But again, this cannot justify and excuse all hunting activities undertaken in the present day and who gets to decide how any “circle of life” should operate, only hunters presumably? Wayne referenced hunting’s claim to conservation, but questioned why hunting is able to ignore the environmental impact of the lead shot used, captive ‘farmed’ (‘canned’) animals bred specifically to be executed by so-called hunters etc.……..none of this is true ‘conservation.’ Hunting fees/taxes paid does not equal conservation; the oil and tobacco industry pay taxes, but no one considers their contributions as ‘conservation’ so just talking about the money is not justification enough. Wayne sees hunting as a “broad church,” but is should not tolerate the negative side, the damaging environmental, ecological impact, and if ‘hunting’ cares so much (as claimed) about conservation then hunting associations/lobbyists should not actively seek to block conservation endeavours as promoted by HSUS. Wayne also questioned how species could be hunted when the science was lacking and how the balance of the hunters’ technology vs. their prey’s defences could be considered conservation? Wolves were mentioned as a historically persecuted species, where hunters insist that numbers must be managed, when of course nature is able to establish equilibriums without such intervention. The hunters’ motives to ensure wolves did not kill the “hunters’” claim on elk (etc.) was cited as the hunters’ real motivation. Adam expressed the view that ‘hunters’ call upon everyone “to trust them, as they have the backing to support their claims…..” But , not all the ‘science’ is aligned in the hunters’ favour and “trust” is built on experience and example, which does not show the hunters’ pursuits as always ethical and above reproach. Eco-tourism vs hunting income explored by Adam, “keep animals alive not dead” is the aim implored for true conservation and every animal life taken potentially has an impact, with ripple effects not immediately obvious through the tunnel of the hunter’s scope. Adam referred to the hunters’ obsession with killing with the example of the Florida black bear; just as population numbers are recovering from historical over-hunting. Adam referred to this as “yo-yo” conservation, where the hunter is forced to relent to save species numbers, but as soon as populations start recovery, the hunter advocates the right to kill the same populations back again. Is this considered and justified conservation? No, it clearly is nothing but a call for killing based on no recognisable science. Let’s explore some more of the debate’s themes……. Hunting “for food” is a compelling argument, when legally sourced, legally and humanely (ie. not indiscriminately and torturously snared) killed, proven to being taken from a scientifically sustainable and regulated source. But this is not akin to conservation by default, as it’s possible to over-hunt species as a food source, such as the increasing burden on predator prey for human bush-meat consumption noted in parts of Africa. However, in hunting for food, the hunters’ ethics often come to the fore, taking only the old, or the weak when necessary to leave the remainder intact and able to self-sustain themselves with minimal disruption, or unnecessary distress (as a food source for future consumption). This is the demarcation of where the ‘ethical’ hunter resides, but somehow their territory has become contaminated and polluted by the “fun hunters’” toxic mix of blood-lust, ego, bullying and funding capacity to corrupt the once hallow ‘ethical’ hunters’ turf. “600-700 Polar bears every year……. However half of the bears that are killed are not actually shot by an Inuit hunter or used by Inuit people. In fact a full half of the bears that are killed are either shot directly by non-Inuit hunters or the “products” i.e. bear parts are sold to non-Inuit people. 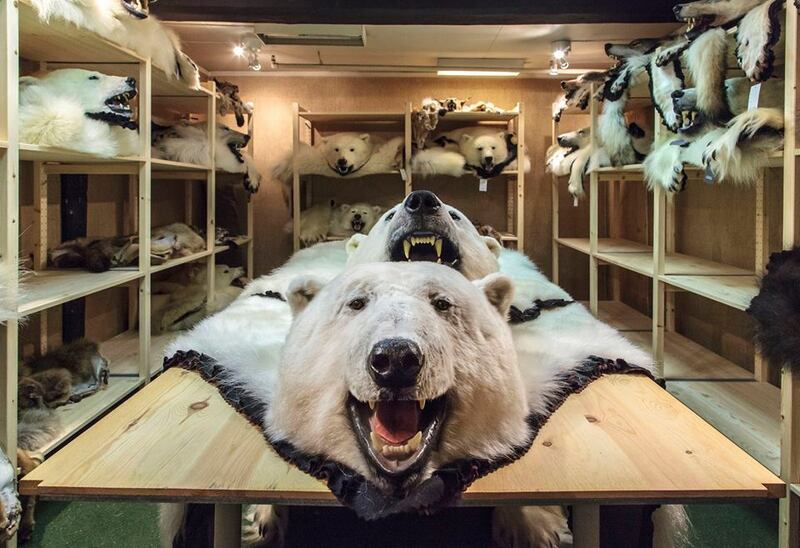 A Polar bear hunting trip may cost between $40,000 and $75,000 dollars” – Captain Paul Watson, Sea Shepherd. 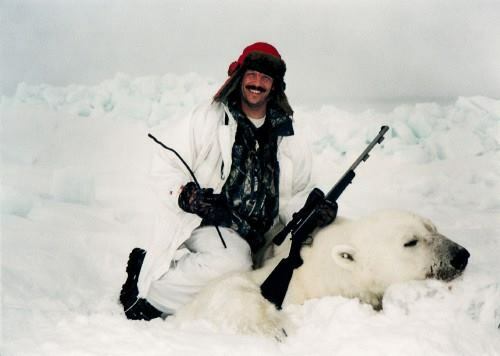 There is clearly ‘big money’ to be made by the Outfitters, plus the Inuit are also able to offset generally low income levels and high levels of unemployment within Inuit communities, by allowing paying hunters to ‘take pleasure’ in paying to kill Polar bears on the Inuit’s behalf. Where is the ethics and proud dignity being displayed by the Inuit, when they are turning Polar bears into a commodity whose life can be sold to the highest bidder? The proven science for setting Polar bear hunting quotas is apparently based on annual updates “through a co-management system that integrates the best available scientific and traditional ecological knowledge.” Is there a clear, independently established scientific divide being made between Inuit Polar bear management and inevitable human greed creeping in to maximise commercial income from the potential over-harvesting of Polar bears? The IUCN Briefing Paper, Annex Case Study 10, supports the above Inuit income seeking enterprise as good. How? Because it provides humans with income? But what about the conservation of the Polar bears and the threats faced? If the Polar bear harvesting advocated is so low impact, then why did the United States list the Polar bear as ‘Endangered’ and ban imports of Polar bear trophies into the United States from 2008 and since pushed for the ‘uplisting’ of Polar Bears from CITES Appendix II to Appendix I protection? The question is can the ‘Endangered’ Polar bears only still deserve recognition by the Inuit because the Polar bear is now a ‘valued $ commodity’ in their eyes to derive income from? Is this a new definition of ‘conservation’ we should all ‘accept’ that despite a historical subsistence killing for food only policy, the Inuit now see the ‘Endangered’ Polar bear as a critical income stream to offset low wages and unemployment and call it ‘conservation?’ Conservation of what, the Inuit? Of course, for vegetarian and vegan diets, the killing of any animal for food is unnecessary, but the methods used are not always above reproach by anyone that questions the ‘ethics’ regardless of their chosen diet. Hunting “for management,” where herd population numbers/control is necessitated by independent (not some authority run by hunters, for hunters), scientific evidence, perhaps with any culled animal of an appropriate species passed to a game dealer as an approved and regulated food source for public consumption. When the science and consensus says yes, then this is acceptable (in my opinion), but such ‘work’ should be conducted by proven professionals (not paying, enthusiastic amateurs) using approved and humane methods. The latter, “fun hunter” hunts for entertainment. This is where the immediate issues with ‘hunting’ arise for many (including ‘ethical’ hunters). This hunting for ‘entertainment’ where the hunters’ ‘excuses’ and immediate emotion to defend their chosen action are portrayed as some kind of sacrosanct, righteous authority to kill – though ‘murder’ should also be an appropriate legal term for all animals wilfully killed some might say. The hunters’ killing “for fun” is purely for the hunters’ self-gratification, but somehow, the whole ‘hunting’ ethos has become embroiled in the defence of ‘all’ hunting it seems at times. Here we also touch on the hunters that believe ‘everyone’ needs such ‘skills’ for “self-sufficiency” purposes, hence the reason given by “fun hunters” why children need to become indoctrinated at an early, impressionable age to hunting. Of course the vast majority of humans (including the dedicated “fun hunters’” own off-spring) will never venture beyond a supermarket, or restaurants for their personal food needs 99.999.% of their entire lives. This perceived ‘need’ based on some looming Armageddon, where hunting ‘skills’ will be vital to survival, strikes me as yet another outlandish “fun hunters’” delusion to try to excuse their addiction to killing animals/wildlife. Here we are also faced with the ‘reality’ that when “fun hunters” say their hunting fees always contribute to local communities and always conserve the target species, then the delusion is more often than not revealed. Plus, the question must always be levelled, if the “fun hunters’” claim to care so much about local communities and the target species welfare, then why doesn’t the “fun hunter” contribute funding directly? Why the need to kill any target species whatsoever and try to excuse it? In principle, clearly no lion, elephant, rhino, leopard, cheetah……..needs to die to fund such a noble causes, the “fun hunter” chooses to kill and tries to excuse it. Personally, my respect for the “fun hunters” would rise slightly from zero if they just admitted they enjoy killing animals, then it would be clear to everyone so concerned where the “fun hunters” true motivation resides. Just because the “fun hunter” can take a ‘legal’ route to kill, doesn’t mean they should, or make it ‘right’ by default when subject to independent scrutiny. The “fun hunter” also seems to feel that the whole ‘experience’ is incomplete without the ’noble hunter with executed animal’ pictures paraded over facebook etc., seeking glory and recognition, but often garnering viral notoriety and derision, which begs the question why do they post such horrific visions and then become alarmed and defensive about the perceived ‘intrusion’ when confronted? Do these hunters not realise facebook is a wide open public space if one’s personal facebook security is left wide open, the same as standing on street corner, parading deeds before the world-wide public. Would they complain then if confronted on a street corner whilst waving pictures of their kills before the world? The hunting industry itself appears to be waking up to the negative publicity this parading of the “fun hunters’” bloody deeds creates. But rather than seek to redress the lack of ethics within its ranks openly paraded, a move to hide the whole sordid business from public scrutiny has emerged. It almost would seem that “fun hunting” is an addiction that afflicts the ‘hunter’ and there is a whole money making industry (with tacit authority complicity) waiting to cash-in, perpetuate and encourage the addiction. Can “Fun Hunting” Contribute to Conservation? Playing the devil’s advocate, where has the “fun hunter” helped with target species conservation? “Lindsey’s team also discovered that hunters were more sensitive to conservation concerns than was perhaps expected. For example, they were less willing to hunt in areas where wild dogs or cheetahs are illegally shot, in countries that intentionally surpass their quotas, or with operators who practice “put-and-take hunting,” which is where trophy animals are released onto a fenced-in property just before a hunt. However…….“it is possible that they [the hunters interviewed] were simply providing the researchers with the answers that would cast them [the hunters interviewed] in the best light” – “Can Trophy Hunting Actually Help Conservation?” Jason G Goldman, 15 January 2014. 2. If poaching was so prevalent (and not excessive hunting), then why wasn’t it proposed to harvest rhino horn to stem demand and thus curtail poaching? Why was the solution needed to keep killing rhino for trophies, when there was potentially an alternative ‘solution’ to help stabilise and protect rhino without the killing? The ‘solution’ given by the hunters is always that killing is a pre-requisite requirement (“or what’s the point?”), regardless of viable non-killing alternatives, morality, or principles of just funding/conserving a species for purely altruistic reasons. No matter how it is dressed up, the paying to kill/conserve argument falls down when “conserving a given species for purely altruistic reasons” is always an alternative option open to everyone (including “fun hunters”) to fund and support. The only reason not to adopt the latter approach is because the killing/trophy is the key driver, not the ‘claimed’ conservation value. In a recent BBC Article, part 4 “Making Hunters Pay“ (Alastair Leithead, 28 April 2016), the argument was made for crucial hunting income. A stretch of water in south-west Africa known as “the horseshoe” – in Namibia’s Bwabwata National Park – is the place to find elephants when the rainy season scatters them far and wide. Brutus Musutela, is a Local Community Ranger. Brutus is a ‘reformed illegal hunter’ apparently, now acting as a guide for paying trophy hunters and helping set hunting quotas – Brutus “now laughs about his transformation from poacher to gamekeeper”……..ha, ha! Hunting is banned in Namibia’s national parks, but the land between them has been parcelled up into separate “conservancies” as they are called – areas where the wildlife is managed by the local communities, quotas are set (see below for explanation of how such quotas are derived) and hunters are invited in. Apparently, in Bamunu Conservancy it’s been used “to buy a communal tractor and four transformers. The power lines being put up will soon bring electricity to its four villages.” So, hunting income is supplying local community needs it would seem, by utilising wildlife for trophies, but I am not clear now how wildlife populations are managed and benefit from the income, but as long as the humans are happy, then that’s ‘conservation’ apparently. “If hunting stops, all the money we are getting will also stop and people will suffer. They will not take their children to school and poaching will increase,” suggests Bamunu conservancy chairman Chunga Chunga. Local Community Rangers, such as Brutus Musutela, patrol their conservancy every day, collating rough wildlife census data – recording “any rare and significant animals they see, any carcasses they come across and any cases of wildlife damaging crops or hurting people.” The census data collated forms the basis for setting hunting quotas, though how scientific and statistically confident the quota setting might be is not revealed – ex-poachers, turned Local Community Rangers are probably not that scientific in their motivations I would dare to suggest. “Accountability is key” – the Local Community Rangers yellow books are made available for all, and “if the money doesn’t reach the people everyone knows” in an effort to stem any accusations of corruption. It is claimed that by Bamunu Conservancy employing local people, this thereby protects the animals that the very same ‘local people’ would otherwise illegally poach. Is this an example of hunting working to serve and protect? “I understand people are getting emotional – Westerners are getting emotional, but here in Namibia it [hunting] is working,” says Bright Sanzila, the local warden for the Ministry of Environment and Tourism. However, this ‘simplistic’ view appears to overlook that the ‘legal’ trade in ivory (and other such animal parts) has allowed illicit ivory etc. to infiltrate the ‘legal’ system/routes, thereby actively promoting and encouraging the scourge of poaching. “Tourism works in a number of places, but elephants exist beyond scenic landscapes. It’s a very emotive issue and people have very strong moral objections to a human being killing an animal, but from an economic point of view sport hunting has played a major role in extending wildlife habitats all over Africa” – attributed to Traffic’s Tom Milliken, TRAFFIC. May be so, but not all hunting is corruption free, ethically based, supporting local communities etc. Bad examples of unsustainable, ethically devoid hunting practices cannot be excused by examples where the hunting model might be seen to be working on a macro-level. One only has to look at the way trophy/”fun hunting” has been perverted into a legal ‘pseudo hunting/poaching option (gleefully promoted by all parties concerned), to establish the immorality and abuse of hunting ethics on open display. Vietnamese ‘hunters’ pay to ‘legally’ kill rhino, to export the trophy and then illegally profit from the rhino horn trade once the ‘trophy’ is back in country. 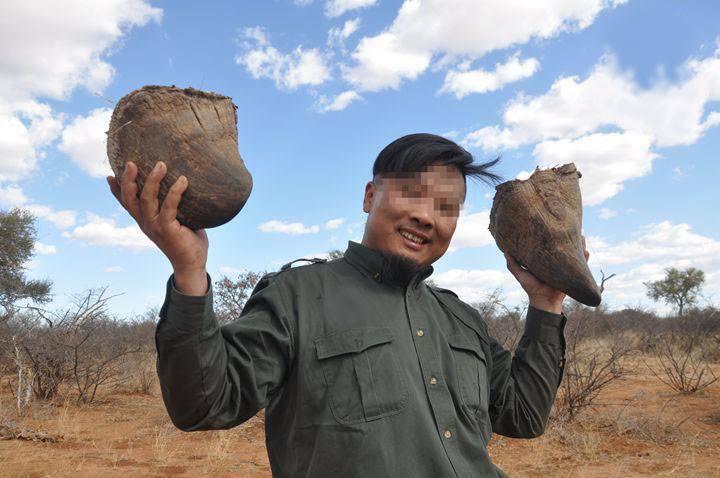 This ‘hunting’ can only develop demand for rhino horn and perpetuate the poaching of such…….does this Trophy Hunting sound like conservation? No, it does not. Are any hunting associations, societies and authorities seeking to eradicate this rouge perversion and safeguard the ‘good reputation’ of hunting? No, they are not. Then there’s the abomination of ‘canned’ hunting, where creatures are purposely bred as an income stream, to be wheeled out and executed by paying ‘hunters’ Nowhere is the lack of ‘ethical’ hunting more widely paraded than in this whole despicable ‘canned’ industry. Of course, there are those only too willing (for a fee) to try give this ‘canned’ industry some air of respectability (such as the South African Predator Association (SAPA)), but the whole thing is clearly a sham and any ‘SAPA Accreditation,’ a paper exercise, with a lack of resources/will to even try to oversee SAPA members’ activities. The ‘canned’ industry is a money making enterprise benefiting an elite, willing to line their pockets from the deaths of animals held captive at the ‘canned’ entrepreneurs’ behest. The ‘ethical’ hunters are being drowned out from both sides, clearly being tarnished with the same brush by some ‘conservationists,’ but the ‘ethical’ hunters are also disenfranchised by the hunting associations’ mass appeal to the non-ethical ‘killers’ and the money they bring, be that PHASA, SCI, DSC, PBA, SAPA et al. I know the PHASA has ‘moved away’ from the deceit of ‘canned’ hunting, but it’s taken 20+ years and strikes me as more of a PR exercise. How many non-compliant PHASA members have been expelled for still being directly associated with ‘canned’ hunting I wonder? Of course the likes of the SCI (Safari Club International is a US based ‘club’ but reaching out to influence the European Union in the SCI hunters’ favour) comes with the backing to ‘lobby’ and ‘advocates’ on behalf of hunters, but appears to back all hunting activities as sacrosanct (when clearly, it is not). Perhaps it is time for ‘ethical’ hunters to form new associations in alliance with non hunting conservationists, basing all activities sanctioned on proven, independent science? The fear is, this approach would find itself underfunded and confronted by the more established, less ethical associations. However, there are problems here, because trying to base any ongoing hunting activity on ‘the science’ is not possible, because the independent science (basic, reliable species sub-population data) just does not exist to cover ‘threatened’ target species sustainability in every hunting range/state/concession. So, it will need money (lots) and time to establish the required science – in the meantime, there would have to be a moratorium on hunting a given target species until sustainability is proven. Such a ‘moratorium’ could only happen if range states participate, which means giving up “critical” hunting income and admitting the science is not there (and has not been for some time, if ever). I think this will be the hardest part to achieve in any shape or form, but without it the non-ethical hunters will keep blasting away because it’s “legal” and “conservation” right (sic)? So, the short term way to achieve some progress, is to stem demand (in my opinion), making trophy imports impossible where the ‘science’ says no. The USFWS lion trophy import ‘success’ is key, as “fun hunters” are predominantly American nationals, but also European Union trophy import bans are needed. Plus, continued efforts to lift the veil of illusion/delusion the non-ethical hunter hides behind to mask activities that serve no purpose, other than the hunters’ self-gratification or financial (pseudo-hunting) motivation. However, some pro hunting lobby groups (Conseil Internationale pour la Chasse (CIC)) are advocating that the ban on imports of Trophy Hunting products is tantamount to “neo-colonialism” and have managed to convince a South African minister to support their cause! The CIC touts that trophy import bans are the same as actually banning Trophy Hunting in African countries. This is clearly nonsense. Only range states themselves can ‘ban’ hunting activities within their own boarders. Trophy import restrictions potentially reduces the demand, because despite the “fun hunters” claims to conservation being a top priority, the “fun hunters’” motivation is really about the trophy and bragging opportunities the trophy will ‘endow’ them with. The burgeoning trade in animal parts through ‘legal’ and ‘illicit’ (poaching) seems inextricably linked – the “fun hunter” pays to kill, the poacher kills to get paid. Both rely on the tacit approval, that the animal victim is a commodity whose death can be bought and sold. The animal ‘trade’ in general (poached/hunted…..) must be radically addressed, which is not just CITES (Convention on International Trade of Regulated Flora and Fauna) regulations, but the whole corrupt edifice that facilities a live/dead animal ending up in Vietnam (or wherever) as a valued commodity with no ‘legal’ paperwork required is unacceptable. Isn’t it time for a complete ban on all trade in ivory, rhino horn, big cat body parts until such time as some semblance of control can be re-established? So, no hunting trophies whatsoever until there is a well-funded enforcement and compliance regime in situ, because where we are right now the current regime is clearly not working/fit for purpose. Inclusion of all populations of Loxodonta africana (African elephant) in Appendix I through the transfer from Appendix II to Appendix I of the populations of Botswana, Namibia, South Africa and Zimbabwe. But when it comes to the rhino, the proposal to withdraw hunting exemptions are currently lacking (South Africa and Swaziland), but with an exploitative, rhino horn harvesting proposal instead submitted by Swaziland. The debate touched on a call for audit, regulation, governance and transparency to be established throughout the hunting industry; from the science to support the setting of hunting quotas, the financial trail of where hunting income actually goes, to the regulation of all hunting activities to clear away the obscurity, corruption and deliberate deceit so apparent in vast swathes of the hunting industry and its advocates. Well of course, but when one sees the efforts in South Africa to defend (the indefensible) ‘canned’ industry, then the uphill struggle faced to introduce the laudable notion of regulation and accountability is clearly seen. 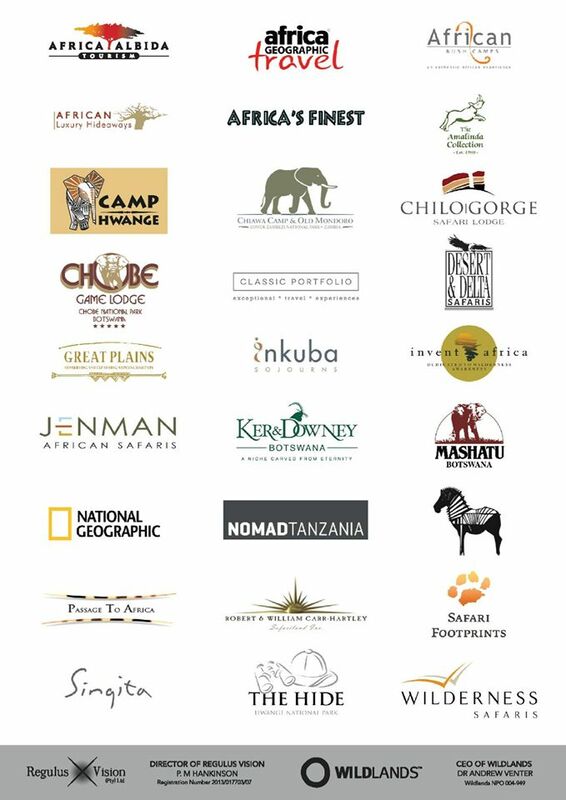 Tourism leaders (see graphic below) have recently joined the ‘Blood Lions’ campaign against predator breeding and all exploitative wildlife activities. The tourism, volunteering industry and public are waking up to the deceit, that ‘cub petting’ and ‘lion walks’ are nothing but money making exercises that eventually leads onto the cub/lion being shipped off to be executed by a paying “fun hunter.” Elephant rides also fall into the same category of abuse and tourism agencies also need to remove promotion and complicity in such….similarly, aquarium shows that abuse captive orca, dolphin, beluga whales etc need to need to stop being promoted by the tourism industry. If ‘hunting’ is to cleanse and reform, the time for doing so is long overdue. “Animal Breeding Systems and Big Game Hunting: Models and Application,” Caro T.M., Young C.R., Cauldwell A.E. & Brown D.D.E, 2009, Biological Conservation 142(4): 909 – 929. “Sustainable Trophy Hunting of African Lion,” Whitman K.L., Starfield A.W., Quadling H. & Packer C., 2004, Nature 128 (6979): 175 – 178.